FREE for a limited time – Ed Emberley’s Shake & Make, a puzzle app for kids. Ed Emberley, an American illustrator, is best known for his work in children’s books. His instructional drawing books use numbers, letters, and shapes to teach elementary kids how to draw. I have been a fan of his work since the 70s when I bought his Great Thumbprint Drawing Book to use in my classroom. It’s one of those books that I keep, in spite of its age & condition. Kids love his books! This fun app brings the artwork of Ed Emberley to life as kids race against the clock to put his drawings back together. First kids study the drawing. Then they shake their device so that the pieces fall to the bottom. The object of the game is to put the drawing back together in 60 seconds or less. There is a “hint” button that gives kids another peek if needed but they lose 5 seconds if they use it. More difficult sets of puzzles unlock as kids correctly solve the puzzles. 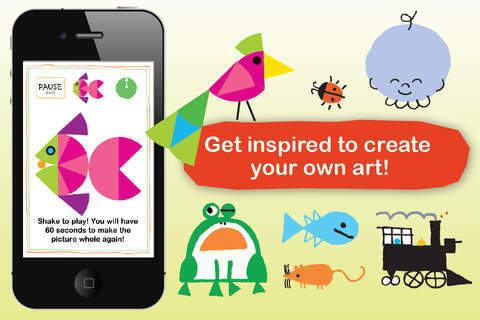 The app helps to build visual memory and it encourages kids to create their own art – LOVE it! !